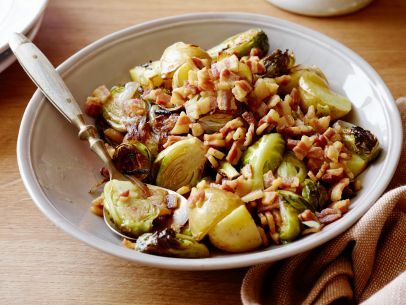 This recipe for Oven Roasted Brussels Sprouts with Bacon is dedicated to anyone out there who is convinced that they don’t like Brussels sprouts! I’ve been right there with you – convinced myself that Brussels sprouts were one of those vegetables that I didn’t (and couldn’t possibly) like! Heat oil over medium heat in a roasting pan or large skillet. Add the bacon or pancetta and cook until golden brown and crisp. Remove the bacon or pancetta to a plate lined with paper towels. Add the shallots to the pan and cook until soft. Add the Brussels sprouts and potatoes and toss to combine. Season with salt and pepper and roast in the oven until the vegetables are cooked through and golden brown. Remove the vegetables from the oven and stir in the butter and lemon juice. Transfer to a platter and top with the reserved bacon or pancetta.